A few days ago we attempted to fly the Skewer Tetrahedral kite but were thwarted by almost dead-calm conditions. Just the occasional puff from a nearby thermal would disturb the leaves of the trees, allowing a quick tow up to 50 feet or so. Followed by a slow descent all the way to the grass! Today was different though. A cool moderate breeze blew around the house, ruffling the treetops and bushes. Aren and I took off in the car, and soon arrived at a nearby reserve. Aren, 5, headed straight for the 'flying fox' in the play equipment area, while I walked some meters over the grass to launch the Tetra. The cool breeze was Southerly, powering up over the slight slope of the field. 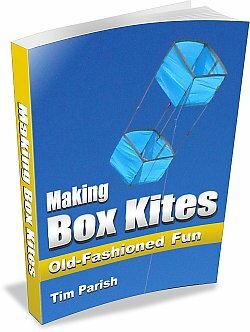 Even the grass blades were quivering in the airflow, so the breeze would surely be enough for the kite. The pale orange Tetra floated up easily, and soon I had walked upwind further and let out 30 meters (100 feet) of line. 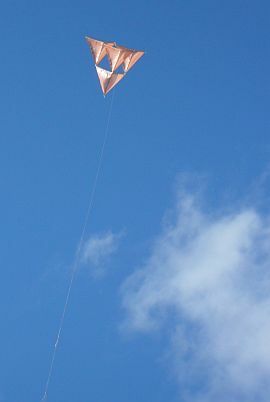 On this length, and with very little sag in the line, it was clear the optimum flying angle of this kite was roughly 45 degrees. Respectable enough for a small cellular design! Check out the lower cell of the tetra, in the close-up shot. See how the down-wash from the upper 3 cells has pushed the plastic out rather than in! It seems the upper 3 cells are doing the weight-bearing, like the wing on an aircraft, while the lower cell is acting like a stabilizer. It's the same in the other photos taken today, so it wasn't just a chance fluttering of the sail material. After a while, I let out the line to 60 meters (200 feet) and enjoyed seeing the Skewer Tetrahdral kite do its thing in the late afternoon sun. Just to see what would happen, I put the wooden winder on the ground. Most of the time, the little Tetra was unable to budge it. However, the stronger gusts did shift the winder over the ground a bit, so it was soon time to hang on to it again. The wind seemed to freshen a little more, and the kite started to loop to the right from time to time. It seems that the wind range of this 4-cell Tetra is somewhat limited. However, there are 2 solutions, both involving tails. A little tail-let added to the left corner of the lower cell would fix the looping. Of course, some trial and error would be necessary, to get the length just right. A simple tail, several skewer-lengths long, could be added to the lower tip of the lower cell. This would certainly extend the wind range, at the expense of holding the kite down to slightly lower line angles. One day, we'll get out there again, and fiddle around with some tails! 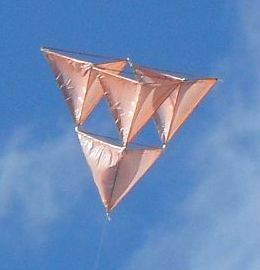 Check out the video down there to see how the Skewer Tetrahedral kite behaves in ideal (moderate) wind strengths. Unfortunately, I have forgotten the exact wind meter readings. By the time we left, the breeze would have been 'moderate, gusting to fresh'.